At Calgary Counselling Centre we are committed to access. We are committed to people receiving the help they need, when they need it. For the past several years, we have worked to improve the well-being of individuals, families, couples and children. We have worked to strengthen our communities and transform the lives of Calgarians, and we have accomplished this all without a waitlist. accommodate the growing number of people needing to access our services. The new Calgary Counselling Centre office is located in the Kahanoff Centre for Charitable Activities in the heart of downtown Calgary. The Centre provides office and conference space to several local charitable and non-profit organizations with leases below market-rate. Our move to the Kahanoff Centre allows us to provide the best experience possible to our clients. Our new space allows us to provide more counselling sessions per year, compared to our previous location. We also have more space to continue our education and training services, a pillar of what we do. A welcome and spacious client waiting room, which includes a small, private waiting area for those experiencing severe distress. Over 40 counselling offices to meet the growing demand for counselling. Large group rooms to provide counselling sessions to up to 13 individuals at a time. 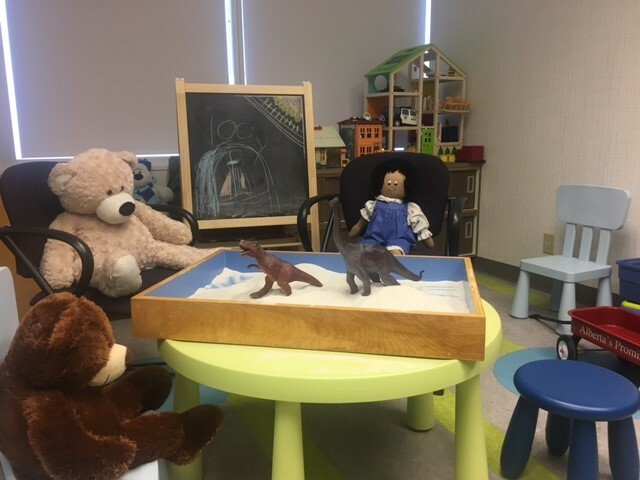 A specialized play therapy space that provides a warm, safe and therapeutic environment for children that includes special toys, games and a place to play. A specialized audio/visual technology program where each counselling office is equipped with a camera and microphone to tape counselling sessions for supervision and consultation. Expansion of our quick-response or urgent appointments to accommodate and assist those seeking immediate support. Security cameras and emergency buttons installed throughout the space. Noise masking white noise is broadcast throughout the space to protect the privacy of our clients. Observation labs that allow for live supervision to ensure students are being trained with leading-edge techniques and best practices. And a dedicated research space that provides ongoing evaluation of programs to ensure clients’ needs are being met. One in five Canadians will experience some form of mental illness in their lifetime. Yet, five out five are affected by it. Thanks to the support of generous donors, our new home at the Kahanoff Centre will allow us to continue to provide compassionate, professional and affordable counselling services to those who need it most. This entry was posted in About Us, Blog, Counselling and tagged Calgary, calgary counselling, counseling, kahanoff, mental health.